A Kitkat chocolate snack is photographed Wednesday July 25, 2018, in Rugby, England, after the European Court of Justice in Luxembourg ruled that the four-fingered shape of the KitKat chocolate bar is not distinctive enough to be trademarked. 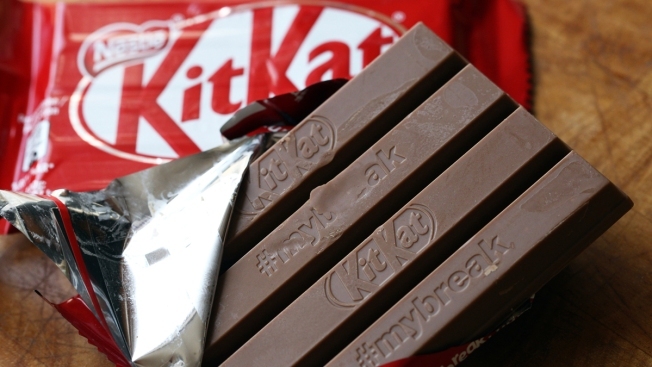 KitKat maker Nestle, has been trying since 2002 to establish a European trademark for the snack. The maker of the chocolate bar has for 16 years tried to trademark its four-finger shape, arguing it is a distinctive feature that deserves protection. Like Toblerone's pyramid blocks, which are trademarked. But a European court ruled Wednesday against KitKat and its maker, Nestle, saying that its shape is not recognized throughout the 28 countries of the European Union. The court instead sided with the makers of Kvikk Lunsj, a Norwegian snack that is a long-time favorite of hikers and skiers — and is shaped almost exactly like a KitKat. The decision will allow Mondolez, the maker of Kvikk Lunsj, to market and sell the chocolate bar more widely throughout the bloc. The court is the latest battleground in the feud between the chocolate bars, which began when the company Freia first introduced the Kvikk Lunsj — which literally translates to "Quick Lunch" — to Norwegians in 1937, two years after KitKat hit U.K shelves. Their battle intensified in 2006 when Nestle secured a trademark for KitKat's shape, only to be challenged by Kvikk Lunsj maker Cadbury, now owned by Mondolez. In 2016, Nestle was stripped of the trademark since the shape of the treat was not considered recognizable throughout the EU. The manufacturer appealed the decision in the bloc's highest court, which today ruled that though the shape was viewed as distinctively KitKat in Denmark, Germany, Spain, France, Italy, the Netherlands, Austria, Finland, Sweden, and the U.K., consumers in Belgium, Ireland, Greece and Portugal did not recognize it. Norway is not part of the EU, but adopts many of the bloc's rules. It is not the first time a chocolate maker doesn't get a trademark. Switzerland's Lindt & Spruengli wanted to protect the shape of its chocolate Easter rabbits covered in gold foil, with a red ribbon. But its case was also thrown out, in 2012, for similar reasons.